I wanted to do a little analysis on the drawdown and recovery period on the S&P500 I would like to do this over even more data than the past 65yrs. Lets first take a visual cue on how this market has performed and then follow it with a table for some added statistics. If I could highlight one point which already knew but it is worth mentioning. The recovery usually takes 2 to 3 times the length it takes to form a trough. I love / hate trading that asymmetry. So much worry, pain and discomfort, and then very quickly it is “I love this job”. The R code I wrote is really very simple and I thought I would add it for completeness. grid.table(t) # I like the look of this table to the standard R print. 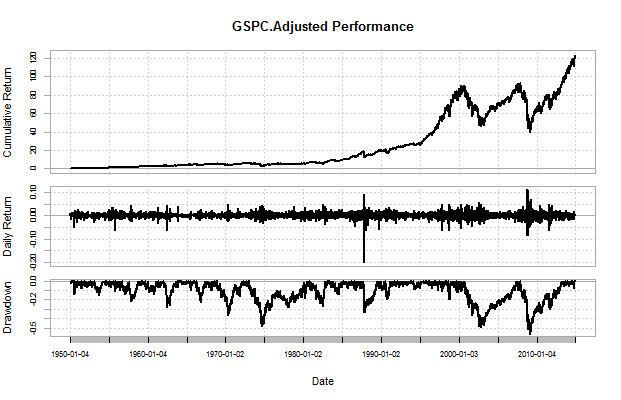 This entry was posted in Charts, Economics, Investments, quants, R code, Statistics and tagged drawdown, S&P500. Bookmark the permalink.